Although it was the largest and one of the most prosperous cities in mediaeval Europe and the seat of the Norman and Anglo/Norman Dynasties from the 11th to the 15th centuries, Rouen owes most of its fame to a humble peasant girl and her tragic end. Jeanne D’Arc, or the maid of Orleans, was born 1412. Claiming divine guidance, she led the French Army to a number of important victories during the Hundred Years War. Needless to say, she made many enemies. Eventually, she was captured, tried for witchcraft at burned at the stake in the place now known as Le Vieux Marché, in Rouen on May, 30, 1431, at the age of 19 years. Twenty five years after the execution, Pope Callixtus III examined the trial, pronounced her innocent and declared her a martyr. St Jeanne D’Arc was canonised in 1920 and become one of the patron saints of France. The Church of Saint Jeanne now stands in le Vieux Marche, on the site where she was immolated. Built in 1979, it is a large structure whose form represents an upturned Viking boat. Its beautiful stained glass windows were rescued from the church of Saint Vincent which stood nearby until it was destroyed in the bombings of World War II. 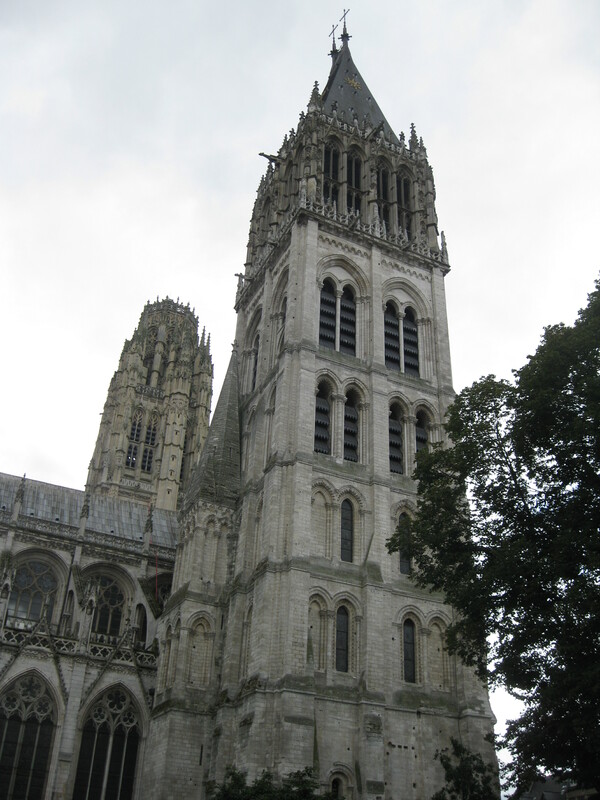 Rouen is also famous for its magnificent Cathedral which has survived war, fire and storms since the 12th century.